Production dates are November 16, 17, 18 at 7 PM and a Monday matinee on November 20 at 4 PM. Tickets are $5 for ASB students and children 12- under and $10 general admission and are available online or at the door. 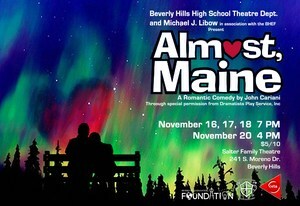 As winter approaches Southern California, the Beverly Hills High School Theatre Department and Michael J. Libow invite you to join us for the romantic comedy, Almost, Maine by John Cariani. The Salter Theatre will become the remote, mythical town of Almost, Maine on a cold, clear, moonless night in the middle of winter. As the northern lights hover in the star-filled sky above, Almost's residents find themselves falling in and out of love in unexpected and often hilarious ways. Knees are bruised. Hearts are broken. But the bruises heal, and the hearts mend—almost—in this delightful midwinter night's dream. Production dates are November 16, 17, 18 at 7 PM and a Monday matinee on November 20 at 4 PM. Tickets are $5 for ASB students and children 12- under and $10 general admission and are available online or at the door.